There are tons of wooden privacy fence styles to choose from. The one you decide on will depend on the amount of privacy you seek and of course, your budget. Having a wooden privacy fence is a great way to enjoy one's private space without giving off the impression of being unfriendly. They are particularly useful in urban areas where people live close together. Consider your requirements before choosing the style. Do you want complete privacy, or just semi-privacy? Be sure of the property boundary by getting a property survey done. Check with the local zoning authorities for any restrictions on fencing. Different areas have different zoning laws that can impose limits on things such as height, material, and placement. Decide on the height you want your fence to be. Think about how many gates are required and where they are going to be positioned. When it comes to styles the options are endless, but there are a couple of basic ideas to start with. If you're looking for complete privacy, you can build a solid wooden fence that will offer as much privacy as a solid wall. The boards are positioned compactly against one another and cracks are so small it is practically impossible for neighbors and those passing by to even catch a glimpse of the yard inside. Solid wooden privacy fence styles usually have vertical panels that are tightly attached together on one side of horizontal rails. When you have this type of wooden fence it's important to stain and protect the wood properly because the boards can bend and warp when and if they get wet. With semi-privacy fences you can have a fence that will keep people out, but that you can still see through when necessary. With this style, boards often have a gap between boards of about one to three inches. 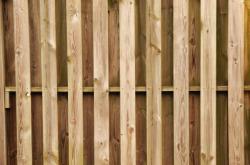 To take the privacy factor up a notch, boards can be staggered (use gaps of a similar size) on the outside of the fence. The fence won't be totally solid, but people will only be able to see through it if they look through at an angle.A similar option for semi-privacy is to place the wooden boards on alternate sides of the horizontal rails. The effect is quite similar, but it uses about half the wood. Because the boards aren't tightly fitted to each other, this style is good for wet climates. When the boards swell in the rain they won't cause damage to each other. Once you've decided on your privacy needs and what kind of style best suits your space, you can figure out how to customize the fence. There are a few ways to do it. Add a narrow section of lattice at the top of the fence for a classic and appealing look. Create a customized shape for the top of each vertical board for a truly unique look. If you want to do something really special, feel free to stray from traditional styles. Attach boards horizontally instead of vertically for a modern look. Create a fence that is solid on the bottom half and a different design, such as lattice, on the top half. If it's not private enough you can always grow some ivy or other plant up it. There are several types of wood that can be used to make privacy fences. Among them are pine, fir, cedar, redwood, cypress, and spruce. Speak to a professional in your area to find out what best suits the weather conditions. For instance, cedar is generally a good option if the fence will be touching the ground as it is more resistant to rot than some others. Price will also no doubt play a part in your choice.If you don't like the color of the wood you're going to use, paint it or stain it to better suit your tastes. It can match the house, deck, garage, or the garden. No matter what the style, it's important to put an emphasis on quality. Be sure to use galvanized metal nails, strong and sturdy hinges, and other good quality fixtures. Don't skimp on the extras because they will play a huge part in the overall quality and look of the fence. When it comes to wooden privacy fence styles the only limit is your imagination. Choose one that suits your taste, is practical for the space and conditions, and within your budget.